ONYX Thrive is the only truly scalable end-to-end workflow solution with network licensing to optimize any size print shop, maximize production and avoid costly downtime. ONYX Thrive workflow software offers print service providers a scalable print production solution based on Adobe® technologies. Print service providers can feel confident about investing in workflow software that fits the way their shop works today, with the peace of mind that comes with the ability to scale up their ONYX Thrive workflow software as their business grows. ONYX Thrive – including ONYX Thrive 211, ONYX Thrive 421, ONYX Thrive 642, and ONYX Thrive 862 – enables a true end-to-end PDF workflow from digital file submission through color management, printing and cutting. The Thrive™ Production Manager browser-based user interface enables workflow control from anywhere, optimizing both operator and output device productivity. 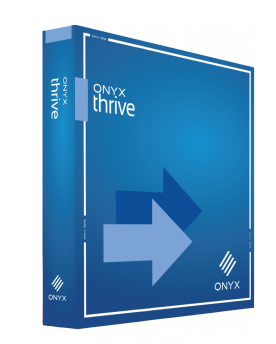 ONYX Thrive provides a network-based license for a long term solution to grow with your business. Users can easily add RIPs, printers, workflow modules and job editors to meet the demands of any print environment. enables users to print right the first time. 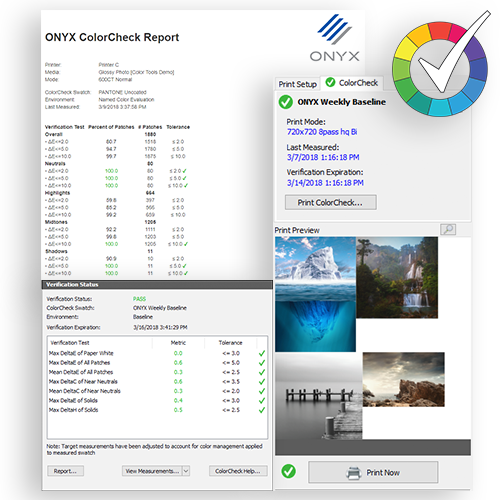 New for ONYX 18 and exclusively for ONYX Thrive is ColorCheck™: a new process control tool for users to prove color accuracy, consistency and conformance to standards including G7 and Fogra. Easily match your customer brand-color needs consistently over time across all your devices and build repeat business. Use in-product indicators that alert users to maintain or re-calibrate printers before printing, avoiding print errors and waste. Export HTML reports for sharing and archiving. 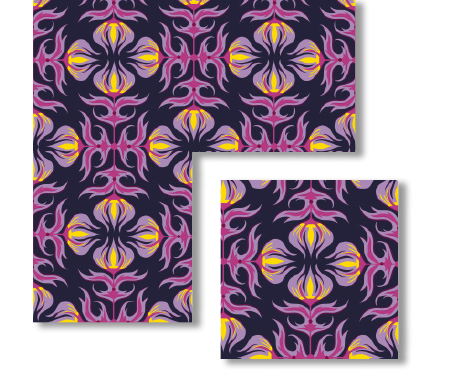 Step and Repeat is now a standard feature in ONYX Thrive, new for our latest version release. To learn more about ONYX Thrive or specific modules, fill out the form below and an Authorized ONYX Representative will be happy to help. Alternatively, locate your preferred ONYX Reseller here. To see more information on the ONYX Thrive configuration, please click here to go to the ONYX Thrive configuration guide.